Carpe Mare Beach Resort is a family-friendly resort located in Akbük, 26 miles from Bodrum City. The resort provides a safe, friendly and entertaining environment for visitors of all ages, with a Kid's Club, private beach and on-site activities that includes a water park and water sports. The region is rich in archaeological sites, as well as good retail opportunities in nearby Bodrum. The region is tourist-focused, with the emphasis on the visitor experience. A complete range of facilities are available on-site, including laundry service, free parking and free Wi-Fi. The resort provides everything that the active family needs for a successful holiday, including the chance for parents to have a little bit of personal space thanks to a fully supervised Kid's Club. Airport transport means that getting to and from the resort is quick and easy. 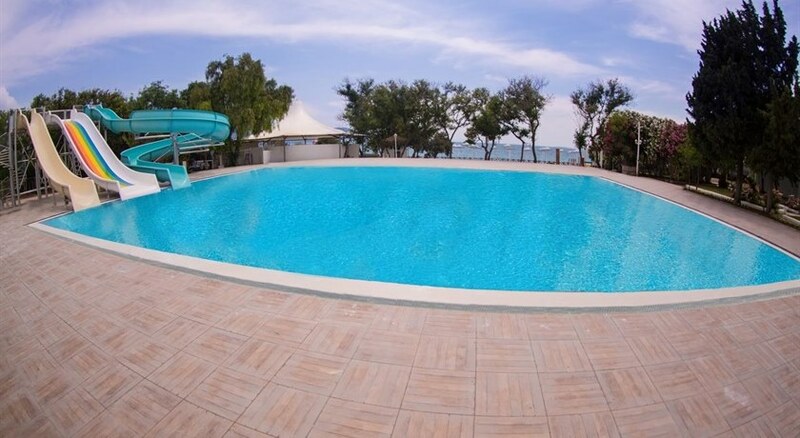 The outdoor pool is expansive and surrounded by a broad sun terrace, while the private beach area is pristine, white sand with clear, good quality bathing that's excellent for diving and snorkelling. A water park and on-site water sports facilities keep kids and adults happy. A selection of gourmet dining, a buffet restaurant, and snack bar are available, and breakfast is free. The 156 rooms are well appointed, spacious and modern. Guests have a choice of single, double, triple or twin rooms. Cots are available on request. Rooms come complete with en-suite bathroom, flatscreen TV, hairdryer and toiletries, and air conditioning. Some rooms have sea views.